Radhika Harlalka's Blog: I am Heartless - A Real Confession! 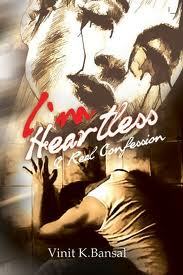 I am Heartless - A Real Confession! still linger in a cruel heart...... in a guilty mind!!! can I trace the reason of my going away and getting back never? I promise I shall close my eyes FOREVER! About the book - These lines have been taken from “I am Heartless – A Real Confession” by a debut author Vinit K. Bansal. The book revolves around our protagonist, Viren, who keeps dreaming about his so called Pari, the fantasy on which he had lived his life. He believes that one day, his dreams would come true when he would meet the love of his life and that this Pari would set everything right in his not so perfect life. Finally, he ends up finding up his Pari in a friend called Rashi but as luck would have it, Rashi doesn’t find her prince in Viren and ends up in a relationship with another guy. Viren is hurt at this panorama but still keeps waiting for her for one and a half years. During this time, another girl called Manasi falls for Viren with all her heart and soul. She seems to be an idol of pure, selfless love who doesn’t expect anything from Viren in lieu of her love. Now, the real question is whether Viren will realize that Rashi is not his Pari and go for Manasi? Will he realize Manasi’s gallant love from him? Will they remain happily ever after? The answers to these are all hidden in this masterpiece. About the author - Vinit K. Bansal, born in Tohana (Haryana), is fond of reading, writing and composing stories since childhood. 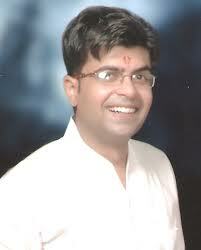 He earned his Master’s degree from Kurukshetra University and was bestowed awards both at college and university level. He continues to nurture his dream of writing till today and has succeeded in giving shape to his thoughts in this book. As a voracious reader and an avid writer, his vision extends to the realm of social service too. In his own words, “I derive inspiration from India's former President, Prof. APJ Abdul Kalam.” At present, he is working with the State Bank of India in Delhi and loves to pen down his thoughts whenever he finds time. My views- The book, which is already a national bestseller, is truly one of a kind. The vocabulary used is fabulous along with the breath-taking story line. The poems, similar to the one I wrote above, finds place in many instances and they add to the beauty to this book. The confession of the author, at the end of the book, is a significant part of the book. This novel runs up especially to those readers who take their loved ones for granted instead of paying any heed to them. It teaches people (like me) a great lesson on love. As a reader, I would rate this book as 4 out of 5. In a nutshell, this book is a must read by all and readers wont regret investing on it. hi there... nice review of the book, will surely try this out... ur friend varun chandak recommended ur blog to me ! Love... Takes a lifetime to be proved!